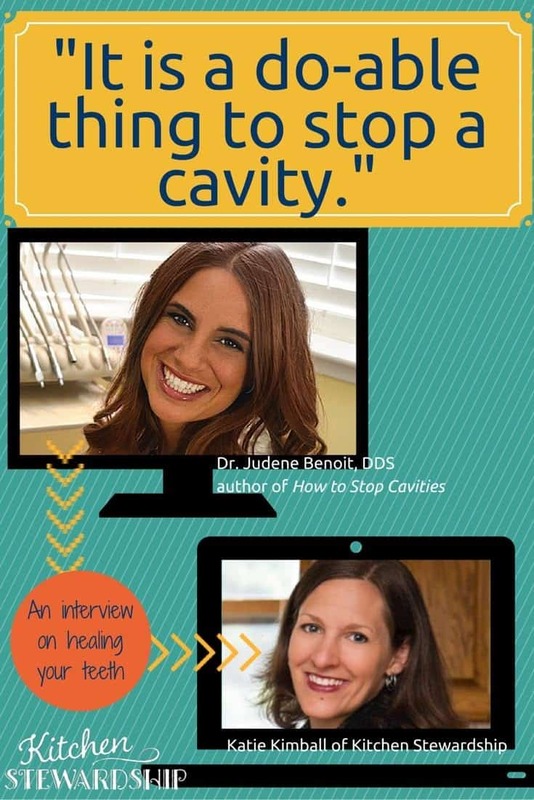 I told you in my last post about my attempts to heal my cavities that you’d love hearing from Dr. Judene Benoit, second generation dentist and author of How to Stop Cavities: A Natural Approach to Prevention and Remineralization. If you can’t view the video above, click through to How to Stop Cavities – Interview with Dr. Judene Benoit to see it on YouTube. OraWellness has a series of free videos called “5 Steps to a Healthy Mouth” that are so good, readers recommended them to ME! Check them out HERE. They cover gum disease and healthy brushing beyond just cavities and are very down to earth. I know I don’t have time to watch videos all the time, so if you’re in that boat, here are the “Cliff’s notes” so you can skim the most important points we covered. Use the timestamps to browse to a section of video if you’d like to hear more. 2:54 Q: On an x-ray do arrested and active cavities look different? A: No! Example of a finger- if it was cut off then we would consider it healed, but it would still be evident that it had been cut off. 3:42 Q: So is an arrested cavity more at risk for becoming active again? A: No, its either the same risk or less of a risk of becoming a cavity again. 5:00 Q: How do we know if it is arrested? A: Its complicated! Can only be diagnosed by a dentist; need to measure growth over time…. if a cavity never grows while taking a series of x-rays (over 3 month periods) then it’s arrested. Then you need to use x-rays to monitor periodically to make sure that it remains arrested. 8:34 Q: How often should cavities be x-rayed? A: monitored every 3 months (the dental school textbook recommendation). Your (Katie’s) dentist recommendation of followup x-rays in a year seems reasonable. 10:47 Q: What are some of the risk factors for cavities? A: Overall health, stress, things that you (Katie) mentioned. 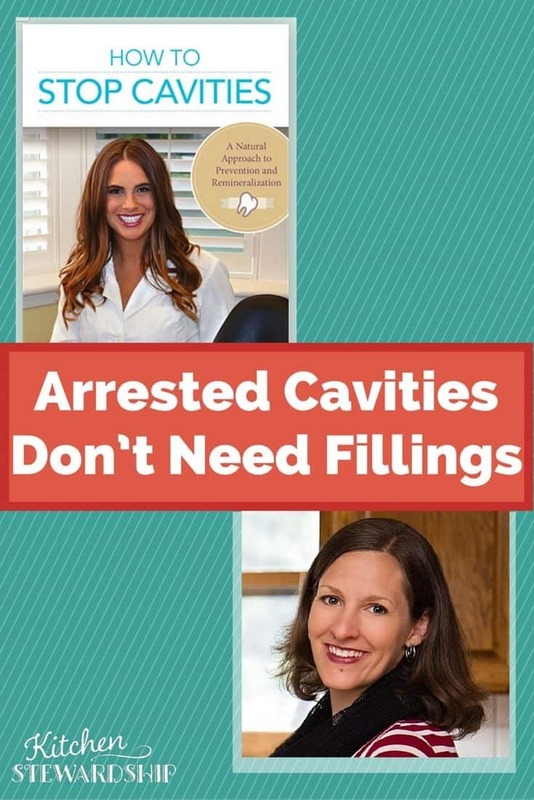 Cavities can also be arrested for many years. 13:18 Digital x-rays show more, so dentists may be seeing more than they were previously. 13:38 K: My old dentist wasn’t very holistic, so he probably would have filled them if they were there. 15:12 Q: is is possible to remineralize both enamel and dentin? A: Yes! 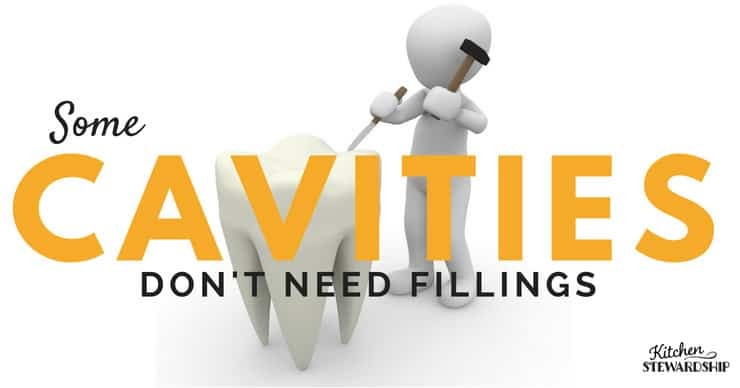 both enamel and dentin can be remineralized- cavities can become arrested in both. 15:30 DJB: Dentin remineralization is way more difficult than enamel remineralization. Also, remineralizing between the teeth is way more difficult… So, Katie’s cavity between the teeth and in the dentin would be a big challenge. 16:30 Watch to see why some dentists don’t want to bother with talking with patients about remineralization! 17:30 Q: What about my plan to remineralize? What’s the right way to remineralize cavities? 18:44 Q: Would you expect a rate of change in 3 months? 20:15 Q: Can enamel fill in but not dentin or neither? 21:35 Q: So what do you do to remineralize? 21:53 Q: Do you do topical or internal treatments? A: Both. 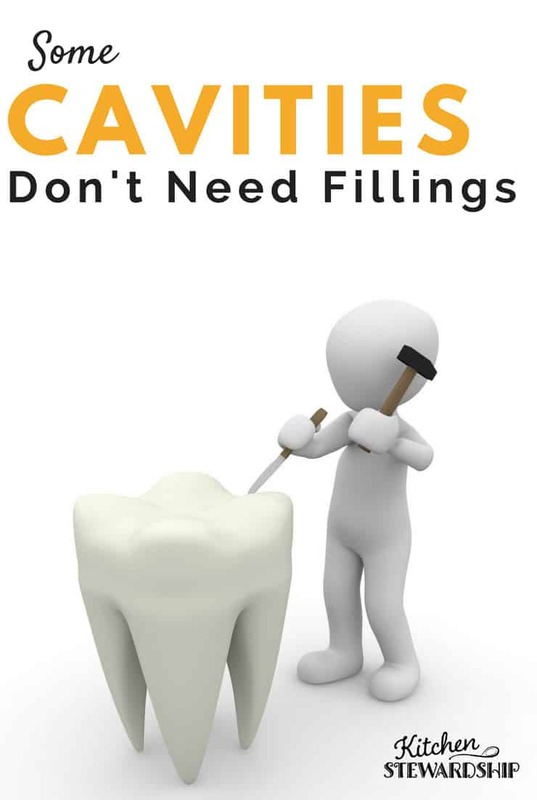 Basically, bacteria + susceptible tooth= cavity… which is a common theme for many conditions or disorders. So, you need to approach and address both of those things. 23:00 DJB: Matrix Metalloproteinases (MMP’s)- enzymes in the mouth that remove damaged parts of the tooth. BUT- these MMP’s need inhibitors so that they don’t remove too much. Example of the gardener- prunes away dead leaves, buds, etc to allow new growth… When bacteria causes demineralization, MMP’s need to removed the dead parts. They are good to clear the damage, but if there are no inhibitors then continual damage will occur. So- an excess of MMP’s and too few MMP inhibitors will cause increased demineralization. 26:57 DJB: There isn’t one right way to remineralize, but it is a do-able thing to stop cavities. Having healthy, healed teeth is possible for everyone. Pin on Pinterest to share the good news! Follow Kitchen Stewardship on Pinterest, especially our Natural Health & Home Remedies board! You can repin this post RIGHT HERE. We’ll hear more from Ramiel Nagel, author of Cure Tooth Decay, next week when the “healing cavities” saga continues! Did you know that you should have TWO X-rays to properly diagnose a cavity??? I tried to Pin this but get a message that there is nothing on the page that is pinable. Thanks you for this intelligent and thorough interview. There is so much confusion around teeth out there. The Devil is in the details and it’s complex but important to know the nuances and terms around oral health. I never had a cavity until after my first pregnancy. I agree– baby gets those minerals out of you, one way or another! Hoping to find a good, holistic dentist in the Springfield MO area. Anyone know of sources for finding a good dentist?